At the turn of the twentieth century, soybeans grew on so little of America’s land that nobody bothered to track the total. By the year 2000, they covered upward of 70 million acres, second only to corn, and had become the nation’s largest cash crop. 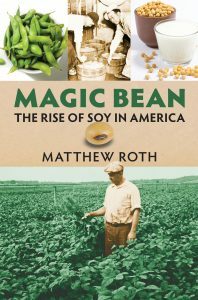 How this little-known Chinese transplant, initially grown chiefly for forage, turned into a ubiquitous component of American farming, culture, and cuisine is the story Matthew Roth tells in Magic Bean: The Rise of Soy in America. 1. When did you first have the idea to work on Magic Bean; The Rise of Soy in America? It emerged from a discussion on the New York subway between myself and a colleague. At that point, I had been a vegetarian for 20 years, so I was familiar enough with using tofu as an ingredient, as well as more newfangled soy foods such as textured vegetable protein (TVP). I had even helped produce commercial tofu at a commune where my brother lived for a time. But I had no real firm sense of when tofu had become a “thing” in America. More to the point, I didn’t know how that related to its other role as a key component in the American system for producing meat. Were these two separate strands of history, or were they causally related? In any case, this double-identity interested me, and I let my curiosity lead the way. I must have been pretty excited about the topic from the outset, because a lady on the subway told my friend and me that we were talking too loudly. Years and years, both in graduate school and beyond. I once heard a museum curator of found objects describe the first step of creating a good collection as assembling a “critical mess,” and research can be something like that. I scouted everywhere for sources: old newspapers, magazines and scientific journals; secondary and primary books; patents; fiction and movies; and eventually a wide array of archives. There was a mother lode at the SoyInfo Center near Berkeley, California, which also provides many primary sources online. Then there was the task of organizing all of this material into a coherent whole: the most complicated jigsaw puzzle you’d ever want to do, especially as there is no picture on the box to guide you. My first approach was sprawling and biographical, but as I worked on the material, I was able to find narrative through-lines that made sense of the soybean’s rise, and this allowed me to considerably streamline the final book. 3. What was the most challenging aspect of researching the story of the soybean? I would say getting beyond the hype. The soybean has had its boosters for over a century, predicting it would be the next big thing long before it actually became the next big thing. And given its steep rise, you could find articles from just about any year proclaiming its recent ascent from obscurity – in 1960, as in 1930, it was said to have been a negligible factor in American agriculture five years earlier, but had now arrived. This made it unclear when the true breakthrough came: the boll weevil infestation of the South in the early 1900s? World War I? World War II? A large part of my work was identifying the false starts, because though the soybean’s rise was eventually precipitous, it was not exactly a straight line. 4. This year soybeans have become the nation’s most-produced crop, overtaking corn. Can you summarize what led soybeans from being almost a forgotten crop at the turn of the twentieth century to America’s leading cash crop? My argument in the book is that the adoption of the soybean by American agriculture, and its incorporation into American food, followed the path of many major innovations. The first phase, from around 1900 to 1930, was one of chance and contingency: it benefitted from broader efforts to bring exotic plants into American farming, and then to find alternatives for both the South and North to what were considered soil-depleting crops. Though the soybean had its boosters, however, it was pretty touch-and-go. It found a firm home in the Midwest in the 1920s with the emergence of a soybean-crushing industry, but this as well experienced some false starts early in the decade. By 1930, however, there was a virtuous cycle of investment not only in processing equipment, but in things like combines to harvest soybeans and in federal efforts to import superior varieties. The Depression era involved efforts to make good on these investments, exploring all avenues of possible – and more lucrative – uses for soybean oil and meal. Government support during World War II to insure increased meat production helped the industry leap forward. As the scale of production increased, and soy became more plentiful, it became a competitive raw material for a wide array of uses, which in turn further promoted its growth. There were limits, though. Sterols in soybean oil were used early on as precursors for synthetic hormones, but until the end of the century, soy hormones were sidelined by those derived by wild Mexican barbasco yams. 5. What are the possible negative impacts of China’s proposed soybean tariffs? Enormous. On the one hand, one would think this was a case where China needed us more than we need them. In the push to industrialize, China has relinquished its lead as a soy producer and depends heavily on imports. On the other hand, however, it has options in the world market. The rise of competition to US soy growers was spurred by a Nixon-era embargo that briefly barred the export of American soybeans. This made the American supply look unreliable to overseas buyers, especially in Japan, which then invested in a nascent Brazilian soybean industry. By the 1980s, competition on the world market was one factor in the farm crisis. But what globalism took away with one hand, it eventually gave back with another: the rise of China at the end of the 1990s, while putting pressure on American manufacturing, was a major boost to soybeans. Up to this point, it has been one of the bright spots for us in the US-China balance of trade. Maybe not for long. I have many different people I’d like to read the book for a variety of reasons. There are my idols in my fields of environmental history and the history of technology, folks like William Cronin and Henry Petroski. There are soybean farmers and researchers, for whom I’d like to provide an enjoyable way to put their work into perspective. For my fellow vegetarians, I’d like to perhaps shed some light on the ways that dietary habits do and do not change. If I had an imagined reader while writing the book, I suppose it would be someone somewhat like myself: curious about the stories behind the current shape of our world, in part as a way of discovering how it might be changed for the better. As it happens, I’m preparing to teach a new undergraduate course on global food history. Right now, I’m reading a pair in books in tandem – Andrew Lawler’s Why Did the Chicken Cross the World? and Mark Essig’s Lesser Beasts (on pigs) – that have some relevance to the soybean, which was a key input in the postwar mass production of poultry products and pork. More than that, though, they are both fascinating, and often funny, explorations into the deep history of the human domestication of the natural world.